If you're as much of a music nerd as I am, then you know that the American concert event of the summer - or at least a strong contender for that title - is the tour Steely Dan has put together, featuring Steve Winwood as an opening act. Both acts are some of the most highly praised in rock music history, by fans and critics alike. To put both of them on the same ticket is a dream come true for people like myself. I won't waste your time with a long-winded and unnecessary biographical introduction to the musicians. If you've heard their names, you know who and what they are. I'll get right down to business. 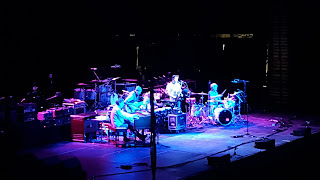 Although his band could have benefited from more involvement from the people in charge of stage lighting, Steve Winwood performed what has to be one of the top-three concert performances of my lifetime. There is no way words can do it justice, but I'll try to explain anyway. I had never seen Steve Winwood perform before, so it's possible that at age 68 his stage show has lost a bit of energy. But what I saw last night was, as Steve himself told the audience, "something a bit more vintage" than what audiences are used to hearing nowadays. I have seen many old video clips of fans breaking down in tears upon hearing the great icons of the 1960s perform - this was the closest I will have ever come to such an experience. So what makes a Steve Winwood performance so different, and so special? The band consisted of five musicians: guitar, drums, hand percussion, a multi-instrumentalist who played percussion, reed instruments, keyboards, and backing vocals, and of course Winwood himself on either his trusty organ or Fender Stratocaster. These five players filled the sonic space beautifully, with intricately arranged performances of Winwood's beautifully written songs. You'll notice there was no bass player in Winwood's band: Steve handled that responsibility himself by playing his organ's bass pedals. Now, for those of you who might not know, bass pedals were once standard fare on organs, but gradually fell out of favor over time. Most modern keyboardists don't even know how to play them. In point of fact, playing bass pedals and keyboards at the same time is a very difficult thing to do, especially while singing lead vocals with a voice that, to my ears, sounded as fresh and healthy as it does on the old Traffic records. But it was an absolute treat - a truly rare experience - to see the "Jimi Hendrix of keyboards" playing bass pedals in his band. Winwood played a mix of classic songs from his most critically acclaimed era and his more "modern" hits, such as "Higher Love." However, given the setup of the band - hand drummer, vintage organ, reed instruments - the songs were presented in a decidedly 60s way. Each song included extended jamming, and the band jammed along in a way that is almost foreign to modern ears. We're not talking about jazz sessionsists trading solos, nor did it sound like the music you'd hear on the "jam band" scene. These are classic songs presented exactly as you might have heard them "back in the day," where the players augment the songwriting with melodic lead work that doesn't scream "Look at me, I'm jamming! Look at me, I'm soloing!" This is the level of playing to which all musicians aspire. The crowd initially took to Winwood's set in a rather passive way. I'm not sure they fully understood what they were getting while they sat through the first couple of songs. But by their third, the crowd had come around to what was going on, and soon enough Winwood was receiving multiple standing ovations. The performance moved me to tears. As a society, we are losing our ability to even recognize music like this, much less play it. Music has slowly devolved into repetitive chants hammered in between chunky, quantized, crude, elementary themes. None of today's artists - even at their best - could present a song like "The Low Spark of High Heeled Boys," with its slow and delicate, but deliberate rise from haunting softness, to the crushing emotional crescendo of its extended solo section, then back down to its eerie final tones. Music like this requires not just technical proficiency, but a deep understanding of what it means to play a role in a musical ensemble. Everyone puts a piece of their soul into the song, something bigger than themselves, and works together to perform a unified piece of music that is far more than the sum of its parts. There is a humanness to it, like the gravitas we feel when we keep extended eye contact with someone we love. If you don't bring that to your music, then you're merely pretending. And we don't realize how much musicians are pretending until we experience performances like Steve Winwood's. It was wonderful. Next up was Steely Dan. You have to hand it to them, it takes some serious courage to take the stage after Steve Winwood. The band came out first, sans Becker and Fagen, and they performed a high-energy jazz instrumental that I didn't recognize. (No, it was not "East St. Louis Toodle-oo.") From the first note to the last, it was obvious that this was a band of very excellent and capable jazz musicians. When they finished, the Dan duo themselves walked out on stage and struck up a two-punch combo with "Black Cow," possibly my favorite Steely Dan tune, and "Aja." So, the first three sets were an excellent foray into some of the more technically challenging Steely Dan material. Soloists from the band would walk up to the front of the stage as they did their thing, and the crowd was delighted. From there, the setlist ventured into more of "the hits." They weren't all there, and those fans who came to see "Do It Again" certainly left disappointed, but the band played for a long time, and every song was a major or minor hit. Sometimes I forget just how many they've had. Of all the players in the band, the drummer definitely stood out. He played each song with an energy usually reserved for hard rock shows. That's not to say that he played like a rock drummer, he just played with that kind of energy - you could really tell he was loving it. And in playing with such energy, he elevated the rest of the band right along with him. He was definitely the MVP of the night. But the story of the set, for my money, was Walter Becker. I don't think anyone would call Becker a bad guitarist, but he also isn't one to make the various lists of "100 Best Guitarists," either. This is a shame. From start to finish, Becker played like an absolute demon possessed. While it's true that he's not a specialist in fast guitar playing, his note choice is nothing short of genius. His complicated and melodic soloing weaved its way through each and every song in the set. It was truly impressive. I'd never heard a guitarist improvise with such inventiveness and with such ease in coming up with really unique and interesting ideas. I guess it's stupid of me to point out now, after 50 years of Steely Dan, that Walter Becker is one of the most unique voices in rock music, but better late than never. I was thoroughly impressed. 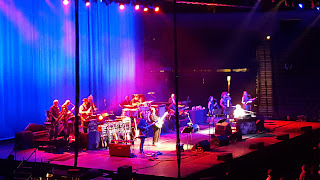 That said, Steely Dan, even with its army of hired guns and ingenious songwriting, simply couldn't live up to the stage set by Steve Winwood. Donald Fagen's voice was weary with age, the stage sound was heavily compressed and focused in the midrange, to try to squeeze as much sonic energy out of the performance as possible. Nothing they could do could match the musical gravitas of their opening act, a man who probably shouldn't be opening for anyone anymore. So, on another ticket, I likely would have walked away quite impressed by the show Steely Dan put on. But you just can follow an act like Steve Winwood.